Looking for a great eco-friendly hotel for your next holiday? Well, look no further – our guide to five of the best eco-travel hotels worldwide will give you all the food for thought you need. A number of stylish eco-friendly ski lodges are popping up off piste. One of the coolest has to be Andorra’s Iglu-Dorf igloos, stylish snow domes perfect for couples or larger parties who can’t bear to be away from the snow. Though cold inside, each igloo comes complete with bed and creature comforts to keep you warm after a long day on the slopes. Spain’s Hoopoe Yurt Hotel encapsulates eco-luxury. 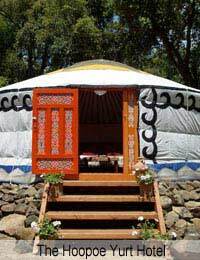 With a bamboo solar-powered bathroom for each yurt and stunning mountain views, this rural, restful retreat is a wonderful place to unwind for a few nights. Yurts offer more substantial living accommodation than traditional camping but still allow you to get up close and personal with nature. The solar-powered Amazon Yarapa River Lodge is set deep within the rainforests of Peru and works on a totally sustainable system. During your stay you can explore the surrounding jungle and catch a glimpse of some rarely seen wildlife in this lush part of the world. While we consider a hotel like this to be eco-chic, for the Peruvians running it it’s a way of life. This is eco-friendly tourism at its very best. Occupying a prime site in a nature reserve in the Namibian desert, Namibia’s Wolwedans is an incredible venture designed to create a sustainable framework for this beautiful part of the globe. Guests can stay in a range of accommodation types among the sand dunes, and with 1000 hectares of land for every bed, this is a million miles away in every sense from towels on sun loungers at dawn. Ever thought of swapping traditional package tourism for a stay in a tree house? Well, the owners of Orion in Nice have done just that. Their amazing tree houses perch high up among the leaves within 7000 square metres of beautiful French countryside. With stylish, comfortable interiors, Orion’s accommodation suits both couples and families and inspires total relaxation. The surrounding area is great for exploring on foot or by bike, so dump the car and allow yourself to be seduced by rural France. Norfolk’s Stratton’s Hotel has won an award for its eco-friendly approach to tourism but its green credentials don’t come at the expense of style. Stratton’s is a stunning boutique hotel, each room individually designed with great attention to detail. One of hotel’s green commitments is to give a ten per cent discount to guests arriving by public transport – a great reason to leave your car at home. There are new eco-friendly hotels and resorts opening every year both home and away, so it’s no longer a challenge to find a good quality green holiday. The wider choice means you can now pick a break to suit your style, from beachside luxury to rustic countryside charm.